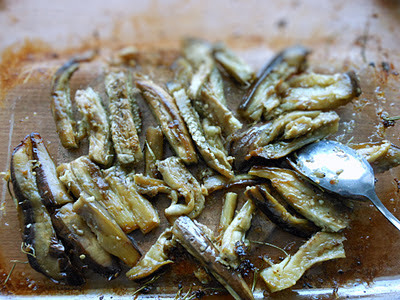 What an enjoyable evening having this yummy, savory side dish yesterday! The aroma of the garlic filled the kitchen, or perhaps the entire floor of my house during cooking. Don't let the recipe scare you, it's not as complicated as it looks. All the steps are pretty straightforward. This side dish doesn't have to be served hot. So you can make it in advance. In order to maintain the crunchiness of the snap peas, make sure you don't overcook them. The whole dish will taste amazing once the assembling is done. Soak quinoa in the water for 10 minutes. Drain well in a fine metal strainer. Combine 1/2 cup of quinoa with 1 cup of water in a small pot. Bring to a boil. Reduce the heat to low. Cover with lid and simmer for 15 minutes. 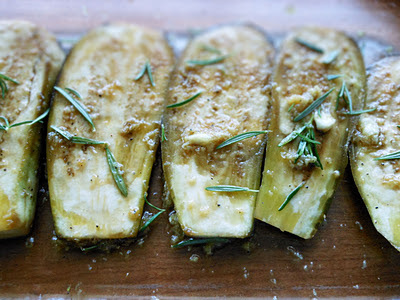 Cut the eggplant into 1/2" slices lengthwise. Arrange eggplant in a 13"X 9" glass baking dish. In a small bowl, mix garlic, ginger, olive oil, fish sauce, brown sugar, and rosemary well. Pour the mixture over eggplant slices. Make sure all the slices are coated with the mixture. Bake for 20 minutes. Flip to the other side, bake for another 10 minutes. 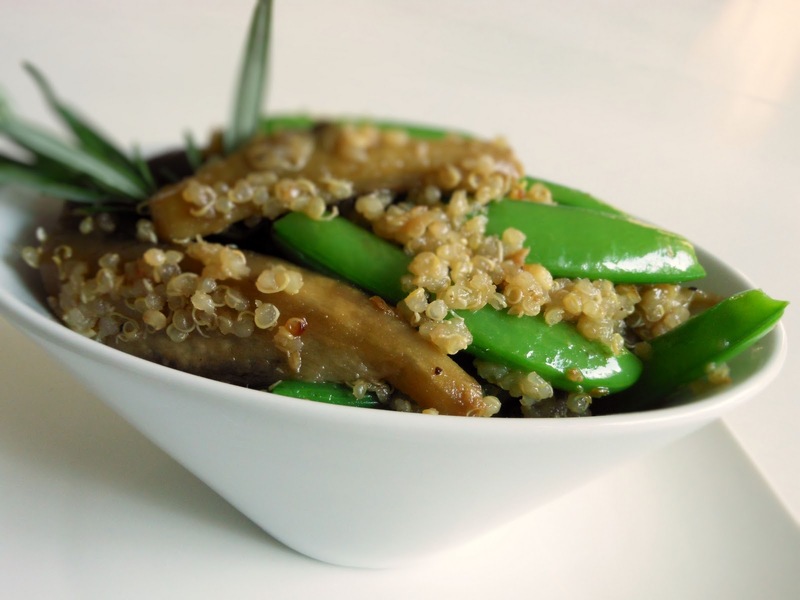 Cook the snap peas in boiling water for 1 minute. Drain well. Heat 3 tablespoons of olive oil in a sauce pan over medium heat. Remove from heat. Add rosemary, fish sauce, and green onion to the oil. Mix well. Keep the baked eggplant in the baking dish. Cut into small strips. 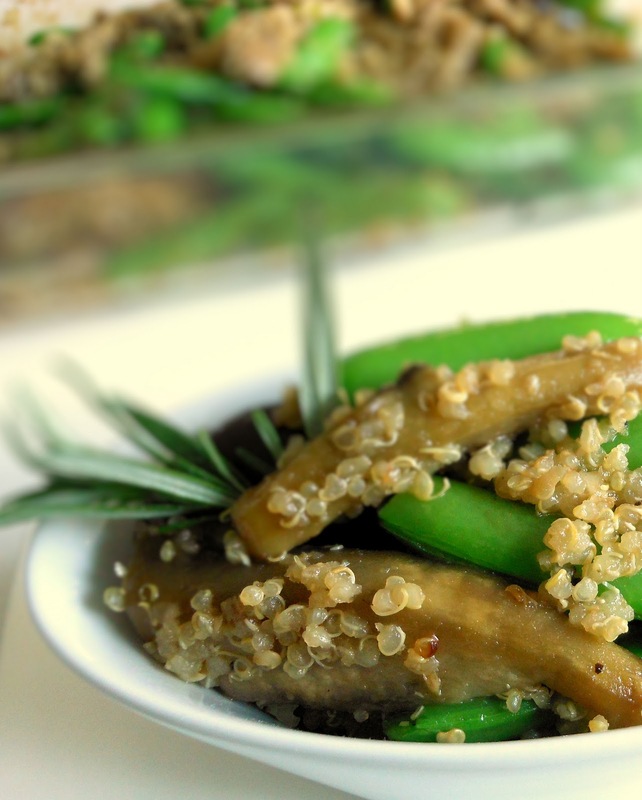 Toss with snap peas, quinoa and the dressing.